Commerce Minister Suresh Prabhu on Monday chaired a meeting of different exports stakeholders to discuss a strategy for doubling Indiaâs exports by 2025. According to the minister, this is necessary in view of the ongoing uncertainty in global trade. At a time when a trade war started by US President Trump is threatening the global trade order, this view sounds quite logical. The sector is already facing no dearth of challenges, and with the global trade war escalating, we must now brace for a changing world. It deserves mention that the Commerce Ministry has already held two meetings with key Ministries for preparing sectoral export strategies. Exporters' body FIEO has also done a study identifying 100 billion exports in traditional, new markets and products. Similarly, the EXIM Bank has conducted market research and a draft export strategy is being prepared. Additionally, the Union Cabinet has already approved a proposal to give focused attention to 12 identified Champion Services Sectors. These efforts are welcome. We need to find a way out to improve and promote our exports. However, protectionism cannot be the solution. Recently, the government said that a task force has been set up to identify various items and policy interventions for reducing India's import dependence. I think such inward-looking policies may do more harm than good. Instead, we should look for better alternatives. A new report has identified at least 100 products where India can replace US exports to China by benefiting from the ongoing tariff war. Such approaches can definitely be more beneficial. Meanwhile, a report last week points out that imports of non-oil items like coal, electronics and leather products are contributing in a big way to Indiaâs import bill. Most importantly, it is domestic supply constraint that is responsible for such high imports. While avoiding protectionism, there is no harm in cutting down such unnecessary imports by increasing efficiency of the domestic supply chain. Govt. of India should make an exporter friendly SME financing environment. Also no threatening attitude of export assisting bodies is acceptable i. e. such as quick refund of GST collected on exports is desired to be refunded immediately on submission of export documents - rather than running after Govt. offices and greasing the palms of related babus / authorities. The commerce minister is thinking of doubling India's exports in seven years from now which I think is too long a period for the estimated increase. 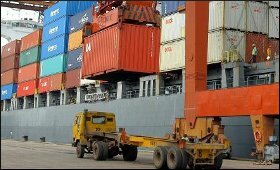 India right now needs a real and massive thrust to boost exports and double within a two year time frame.The target can be achievable only if the massive bottle necks are removed with rational incentives,simplified exports procedure, ease in custom clearances, removing most of the manual obstructions by Customs deptt., almost zero cost escalation of raw materials etc. can pave way to meet the target within 2 years. Indian Goverment should emphasized now on allocating a chemical zone in different parts of India so that our Chemicals and Pharmaceuticals should grow and expand their capacity for manufacturing of APi's and pharma chemcials, which are shortage in Indian and world amrket becuase of chinese pollution issue, let India dominate now in world for this. For this Indian govt should provide all those subsidies and expedite all govt fomulaties to start and execute production, this will boost new investors/ manufacturers to come ahead and start manufcaturing and will also calm down pcies of many pharmaceuticals drugs where prices are incresing everyday, and tghe sufferer will the common Indian. Let Indian indutry and commerce minister think on this and get new ideas/viees and booming this field now. Congratulation of the govt. by looking into the matter of export. So many items are unnecessarily imports such many manufacturing items as well as automobile items which could be developed, manufactured locally. Also gold which has no essential from the development point of view.Secondly tons of gold are stoareged in many temples, bank needs to withdraw from them on top priority. Most importantly to ban on imports of cars, luxury items. Initiative to be taken for high technology, agriculture production, Manpower utilisation, stoppage of corruption (even after 7th pay commission), Death penalty to corrupted employees, politician etc. Lastly & most significantly I have to mention population control. Shall be punished to death if a family have more than two child from today onward. Unless otherwise develop activities has no meaning. It is also to be noted that the corrupted, thieves shall be strictly prohibited for any election. Our indian product is expensive in the world market. 1 to stay in competition doesn't need subsidy. 2 but need product value and cheap price. 3 for that 3 three things are important....a cheap electricity.b cheap gas/gasoline....c cheap transport. (container price). Very important is hanging documentation connected with govt.should be ease and fast! These would be a big help for producer to bring our product cheap and good quality in competing market everywhere.